Hafa adai and welcome to Guam and the Marianas Yacht Club. To help make your visit enjoyable and productive, the following information has been compiled for you. On arrival, call Ports on Channel 13 to request permission to enter Apra Harbor and to confirm that Customs and Immigration will go to Marianas Yacht Club for processing. The yacht captain shall come ashore with the normal entry paperwork to meet Customs and Immigration officers. Officers will not come out to boats, but will await for the Captain to meet the Officers on the clubhouse patio. MYC has moorings, but does not have docks. It is best for arriving yachts to have a dinghy prepared to bring you ashore since MYC relies on member volunteers and does not provide this service. Mark Anderson, First Rear Commodore of Docks and Harbors is available to assist you. Please contact him at mycmark@yahoo.com or 671-864-4185. Contact should be made prior to arrival . Upon arrival further assistance for specific requirements may be requested through the MYC Board at board@marianasyacthclub.org. If you clear in after 1700 or on the weekend, be prepared to pay an overtime fee. If you are non-American without visa, be prepared to pay a fee to apply for a visa. DOGS, CATS, BIRDS, etc. must be declared and will probably face quarantine or other restrictions. 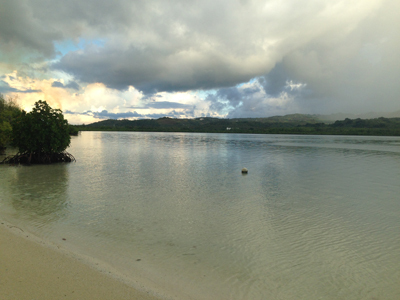 Marianas Yacht Club, located in the clean waters of the Sasa Bay Protected Reserve, offers excellent shore facilities for visitors wishing to stay in Apra Harbor. 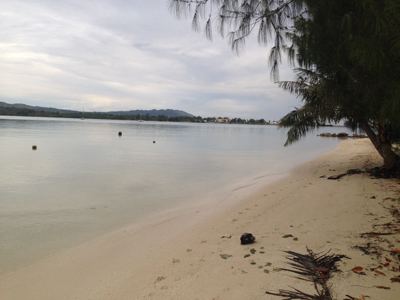 We provide a clean beach for dinghy landing and storage (the only easy shore access in Apra Harbor), potable water, trash collection, on demand gas heated shower facilities, local telephone service and free internet access. The club facilities include a large covered, open-air clubhouse patio, toilets, showers, an outdoor gas BBQ, parking for cars and gated security. Guam is served by the US Postal Service and visiting yachts may have packages sent to MYC on their behalf. See below for more information. MYC has an active social life on Friday evenings from 1700 to 2100 and Sundays from noon to 1800 when sailing activity is scheduled, later hours on other Sundays. During these hours Friday dinner specials, sandwiches, snacks, beer, wine and soft drinks are sold. Visiting yachts have full access to this food and drink. MYC has an extensive library of charts for pan and books for swapping. You are welcome to join in our racing, sail classes, and social events while at the club. Depending on demand, mooring buoys are generally available for visiting yachts. MYC inspects the moorings on a regular basis, however, MYC can take no legal responsibility for use of a mooring. Since mooring pennants are subject to chafe and marine growth, visiting yachts using a mooring should inspect all the components and provide their own lines or other equipment if deemed appropriate. Please contact Mark Anderson if you are interested in a mooring so that availability and appropriateness for your size vessel can be determined. We extend one day free use of our services, facilities, and mooring. Thereafter we charge $7.00 per day for MYC services, facilities and mooring. Crews in excess of four persons will be charged an extra fee of $1 per person per day for the additional use. Fees are payable weekly on Sundays. Registration forms for visiting yachts are located by the phone at the snack bar. Use of the BBQ should be coordinated with Peter Linn or Victor Torres to understand safe operation and to avoid scheduling conflict. If you stay longer than 12 weeks, you must apply for a regular or temporary MYC membership. Mail, including yellow package notices, is picked up by the Treasurer on a weekly basis. If you personally pick up packages, the yellow package notice is required and you should present a photo ID. If you become a regular member, you must establish your own mailing address in Guam. MYC does not act as a mail address for members. Please deposit all boat trash in the dumpster outside the gate. Do not use the bins by the patio as these are for snack bar patrons only. Our rules and regulations forbid the disposal of hazardous trash in the dumpster or on the grounds and our landfill requires recycling of cardboard. These items MAY NOT be placed in the rubbish bin. Respect our environmentally sensitive area. Contact a board member for information on proper disposal of hazardous waste and cardboard. You may use the telephone for any local calls. Please restrict your use of Directory Assistance as these calls are charged to the Club. Long distance service is blocked, so you must use a credit card, phone card, or call collect. Phone cards may be purchased at nearby gas stations. We have one line for members to call in or out. Be mindful of long class. Our number is +1 (671) 477-3533. The club has free WIFI available for all visiting sailors. This is generally accessible from the clubhouse area and grounds only. Laundry may not be done on the club premises. 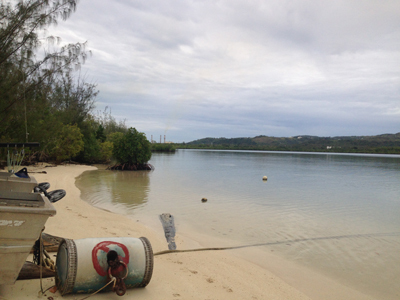 Our location is on Sasa Bay, which is a Marine Preserve that promotes marine life. Detergents and cleaning chemicals will adversely affect the wetlands area. Please help us preserve the environment. Laundromats are located throughout Guam. Guam has a public bus service: the closest stops are in the village of Piti. Schedules and fares can be located at www.grta.guam.gov. Most visitors find it convenient to rent a car for in-town shopping and errands. There is a supermarket within walking distance at Piti, but most shopping requires a vehicle, especially Home Depot, K-Mart (the largest in the world), the Micronesia Mall in Dededo, and Agana Shopping Center in Hagatna. Guam has a good range of grocery, hardware and support services. Club members can provide recommendations. Rental cars are available from normal rental companies such as Hertz, National, etc. There are also local suppliers: Cars Unlimited will pick up and deliver cars to MYC and Blake's Car Rental is another local low cost provider. New to Guam is Stroll Guam strollguam.com, our Uber-like service. Taxi service is also available, but expect to pay higher prices. MYC and its members look forward to your visit and hope that you schedule enough time to get to know MYC's membership and our Guam environs! Please join us for dinner on Friday nights from 6pm to 9pm or on Sundays from Noon to 6pm.